As part of their recently released Air Quality Action Plan, Cambridge City Council are implementing strategies to increase the number of electric taxis operating within the city. A partnership between Cambridge City Council, the Greater Cambridge Partnership and Electric Blue, will see charging infrastructure installed throughout the city, thanks also to funding granted by OLEV (Office for Low Emissions Vehicles). In a bid to tackle rising health issues caused by petrol and diesel vehicle emissions, the City Council have released a forward thinking Air Quality Action Plan, in a bid to dramatically improve air quality over the next five years. To achieve this, one of the priorities is to increase the number of electric taxis operating within the city. To make this a reality, incentives and rewards have been introduced to those who convert to an electric vehicle (EV), including discounted taxi license fees. With around 330 licensed hackney carriages, and over 1,000 private hire vehicles, the policy will make a real impact on improving air quality by aiming to have converted all taxis to electric (or low emission vehicles) by 2028. Persuading drivers into EVs without suitable charging infrastructure. Phase 1: Installing eight Rapid chargers. In order to facilitate the electrification of the taxi and private hire fleet, Cambridge bid for, and won, funding to install a network of 21 charging stations into Cambridge and the surrounding area. Funding has been awarded from OLEV (£ 426,000), along with contributions from the Greater Cambridge Partnership and the City Council (£ 100,000 each). In order to convince people of the benefits of EVs, and persuade taxi passengers into electric taxis, Electric Blue were brought in to install and manage the charger network. To further increase EV uptake, Electric Blue also uses its EV expertise to work closely with drivers, vehicle suppliers and the local community; spreading awareness, and bringing supply and demand to the EV marketplace. 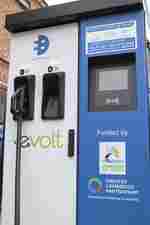 As of October 4th, Electric Blue have installed two Rapid chargers into Adam and Eve car park, with a further two in Arbury Court car park. Two additional Rapid chargers have been installed in Castle Hill car park and are due to be made live shortly. The first phase of installation will be completed with the final two chargers due to be installed soon into a site on Newmarket Road. These first eight Rapid chargers are capable of providing 80% charge to an electric taxi, in as little as 20 minutes. The latest generation of Nissan Leaf, which has a greater range, can travel up to 180 miles on a single charge. Electric Blue, along with their partners Swarco, arranged a launch event for existing taxi drivers and Otto hire cars to attend. Two demonstration models were also in attendance: the Nissan Dynamo - 100% electric taxi; the LEVC electric taxi - with range extending petrol engine. Electric Blue staff were on hand to provide guidance on using the chargers and accessing the charger network. Some of the latest generation of EVs were available for drivers to trial, as provided by staff from Otto cars. Good Energy, who supply 100% renewable energy to the chargers, even offered to provide free electricity for the day, to everyone who needed it. The launch event was a huge success! Taxi drivers who currently drive electric vehicles were in attendance to witness the official launch of the chargers, and to learn more about the network. They also provided some excellent feedback on the locations for the upcoming installation phases. Drivers who held reservations about converting to EVs had their questions answered by knowledgeable Electric Blue staff, and other existing EV drivers. They were given the opportunity get into an electric taxi, and test drive an electric vehicle. For those who wanted to explore the benefits of electric taxis even further, short-term EV hire was also available, allowing them to experience the perks of EV driving in their real-world environment. So far, the chargers have provided more than 7,500 emission-free miles, and with the level of enthusiasm from taxi drivers and vision from the City Council, this number will continue to increase. Every mile driven in an EV equals fewer harmful pollutants in the air that we all have to breathe - given the option, wouldn’t you choose an electric taxi?